Optimist model, scale 1 : 10. Made with great detail. Polyester hull with Aluminum spars, metal fittings, wooden rudder and daggerboard and preshaped sail. Displayed in acrylic box. Simple inexpensive Optimist model, scale ± 1:15, Complete with spars, sail, foils and 3 airbags., For prizes or as a small gift, Hull: 16 cm long, with wooden stand. 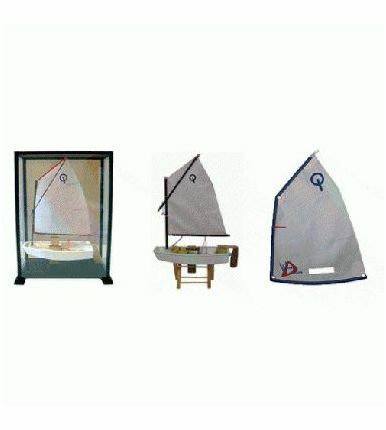 Optimist mini sail, scale 1:6 , 47 cm high. Made of real Dacron, with window, sailbattens and class logo. Reinforced corners with eyelets.